Why I Sometimes Like Clichés. I was surfing the net instead of editing my latest writing project when I came across a long list of clichés not to include in submissions for a particular literary magazine. It was a pretty long list, including ideas like “twins separated at birth meet accidentally and fulfil a destiny,” “spunky female heroine who dresses as a boy” or “vampires as tragic romantic figures.” I get it, I do. Clichés…overdone. I mean, hey, Stephanie Meyer kind of did vampires to death and the whole wizard/magical doorway thing has been told in a lot of stories. 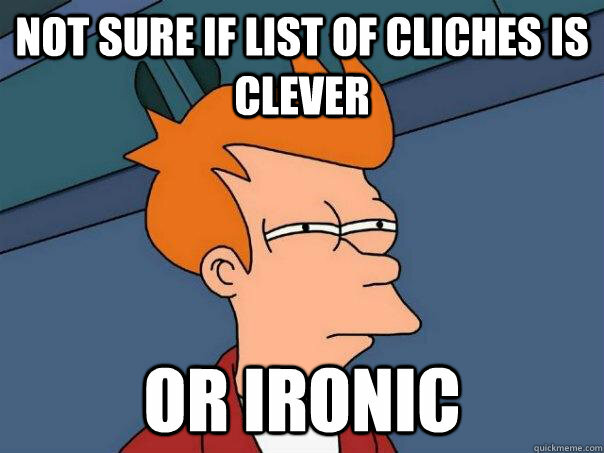 Except…I still kind of like clichés. When I think about all of the stories that I liked as a kid, they all had some element of cliché in them. One of my favourite series of all time is Tamora Pierce‘s Lioness and Wild Magic series which are all about the spunky heroines. All of the Meg Cabot books have a heroine with something to say too. In a way, I think Pierce’s books are/were groundbreaking, except that the idea of girls dressing like boys to achieve a goal isn’t exactly new. Shakespeare used it in The Merchant of Venice and it probably wasn’t even his idea first. What’s the big deal with clichés? If you haven’t already read Lev Grossman’s The Magicians trilogy, it might just blow your mind. I’m noticing a trend lately that stories that use familiar elements from childhood books like Narnia and Harry Potter are making a huge comeback. On the one hand, you could argue that these authors are in a way telling the same story over again from a slightly different perspective. In The Magicians, Quentin has a somewhat similar experience to Harry Potter in that he attends a wizard school. SPOILER ALERT: he even visits a Narnia-like place. For all intents and purposes, Quentin is a hero who goes through a magical doorway after learning some magic and has lots of adventures that involve magical beings. Would you call Grossman’s story clichéd? (I’m sure some a-hole out there has said it). But here’s the thing. When done well, clichés can be powerful stuff. Take Rainbow Rowell’s new book, Carry On. Not only does it have a Hogwarts-esque wizarding boarding school, but there is also some vampire romance and a lot of mythical creatures. Some might say there’s a whole lot of cliché fantasy elements in this book, but Rowell finds a way to make these popular ideas different and fresh. I think what differentiates between literary awesomeness and boring cliches boils down to this: it’s how you use it that matters. Is it possible for a cliché to come back into fashion, kind of like bell bottoms and that heinous acid wash denim has? There’s a theory floating around out there that there are only seven basic plots. I’ve probably mentioned this before, but it’s something that I think about a lot. As a writer, I’m always trying to write something different. Something unique. Except, if there really are only seven basic plots, then one could argue that there are only a finite number of stories to be told. Maybe we tell stories and keep on employing clichés they hold some sort of cultural meaning or value? Maybe, we shouldn’t give vampires and wizards and spunky heroines so much trouble. After all, they’re just here to tell a good story.